The Greenwich Free Press is reporting that an arrest warrant has been issued for Heidi Lueders, a former town resident and head of a pit bull rescue organization who has been identified as the subject of an animal cruelty case in Fairfield. 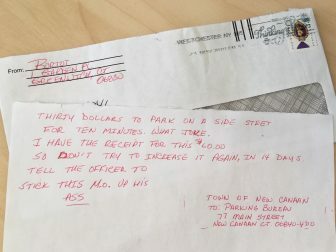 New Canaan Police through the department’s Instagram account has issued safety tips for residents making online purchases in order to avoid becoming a victim of package theft. They include signing up for delivery alerts, ensuring someone is ready to collect the package, requiring a signature when possible and having packages sent to a workplace if feasible. Asked about the Tourism and Economic Development Commission he plans to create, First Selectman Kevin Moynihan said locals have expressed strong interest in joining and that, after candidates are approved by local town political committees, the group will see about 15 total members. The town on Wednesday issued an after-the-fact building permit for a $10,000 job at a Putnam Road home. A new bathroom with a shower had been installed in the basement of the home by New Canaan-based Hoffman Contracting LLC, the permit said. 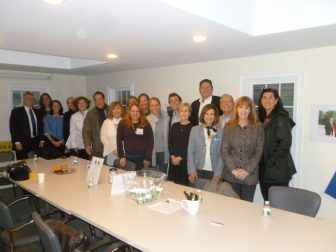 The New Canaan Community Foundation won the second annual “Most Generous Town” competition. 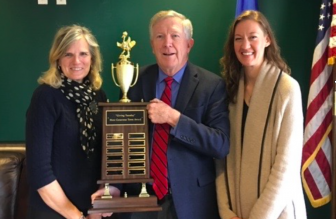 NCCF raised more than $160,000 over a six-day span that included online and mobile giving, as well as events at local stores and restaurants, beating the Community Fund of Darien by a few thousand dollars in the friendly rivalry. Police at about 4:22 on Nov. 23 cited a 31-year-old Naugatuck man for possession of less than .5 ounces of marijuana after stopping him on Route 123 for driving with illegal window tints. The Planning & Zoning Commission during its regular meeting Tuesday approved two site plan applications that will see vacant commercial spaces on Main Street filled—one by Club Pilates and another by Stretch Lab. The “Insider’s Guide” to the Holiday Stroll that kicks off Friday evening is out (here). Photo of Real Estate leaders and CT Legislators (L to R): CT Association of Realtors Chief Counsel Jim Heckman, Melissa Rwambuya, NC Board of Realtors Executive Officer Lori Kelly, PJ Taylor, NCBOR President Janis Hennessy, Bill Larkin, Candace Blackwood, Lucy Dathan, Amanda Briggs, Alex Bergstein, Will Haskell, Kathy Pasternak, Tom O’Dea, Marsha Charles, Joe Scozzafava, Tracey Ozendo and Kelly DeFrancesco.